Happy 164th Birthday, Tommy E! 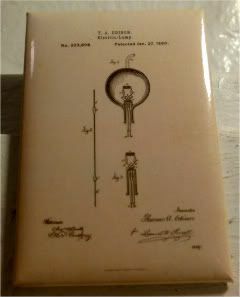 I figured it was apropos to use this patent of Thomas Alva Edison's Electric Lamp for today. Did ya'll know that he and the folks in his workshop applied for almost 1,100 patents? That's a lot of inventing. The date on this drawing was January 27, 1880, and it's Patent No. 223,898. The electric lamp/incandescent light bulb was one of his three major inventions, the other two being the phonograph and the moving picture camera. Think about it - it's three inventions that we couldn't live without these days. We never think about them, because the descendants and evolutions of those inventions are ubiquitous. And to think, I'm still waiting for my own million-dollar idea - just one! - to hit. I do wonder if Edison sits up in heaven, looking down at all the pinpricks of nighttime lights scattered across the Earth, and think, hey, I did that! Incidentally, I actually tried to get my dad and sister to roadtrip out to Edison's workshop out in Jersey. After driving and driving around for what is surely a piece of Roadside Americana, we managed to find a trailer that was supposedly his shop. I never lived down the wild goose chase I led us on, but I was more disappointed with what they had to offer, given their historical importance. Maybe one day, I'll be able to find the real Edison workshop.